Using data from NASA's Moon Mineralogy Mapper instrument, scientists have identified three specific signatures that definitively prove there is water ice at the surface of the Moon. 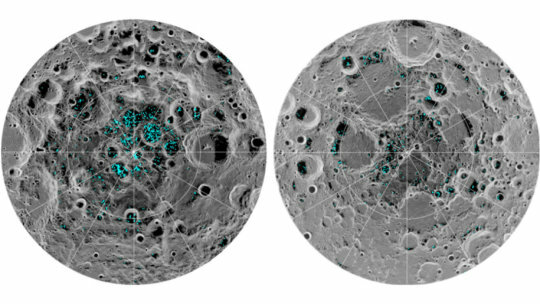 The image shows the distribution of surface ice at the Moon's south pole (left) and north pole (right), detected by NASA's Moon Mineralogy Mapper instrument. Blue represents the ice locations, plotted over an image of the lunar surface, where the gray scale corresponds to surface temperature (darker representing colder areas and lighter shades indicating warmer zones). The ice is concentrated at the darkest and coldest locations, in the shadows of craters. This is the first time scientists have directly observed definitive evidence of water ice on the Moon's surface. In the darkest and coldest parts of its polar regions, a team of scientists has directly observed definitive evidence of water ice on the Moon's surface. These ice deposits are patchily distributed and could possibly be ancient. At the southern pole, most of the ice is concentrated at lunar craters, while the northern pole's ice is more widely, but sparsely spread. A team of scientists, led by Shuai Li of the University of Hawaii and Brown University and including Richard Elphic from NASA's Ames Research Center in California's Silicon Valley, used data from NASA's Moon Mineralogy Mapper (M3) instrument to identify three specific signatures that definitively prove there is water ice at the surface of the Moon. M3, aboard the Chandrayaan-1 spacecraft, launched in 2008 by the Indian Space Research Organization, was uniquely equipped to confirm the presence of solid ice on the Moon. It collected data that not only picked up the reflective properties we'd expect from ice, but was able to directly measure the distinctive way its molecules absorb infrared light, so it can differentiate between liquid water or vapor and solid ice. Most of the newfound water ice lies in the shadows of craters near the poles, where the warmest temperatures never reach above minus 250 degrees Fahrenheit. Because of the very small tilt of the Moon's rotation axis, sunlight never reaches these regions. Previous observations indirectly found possible signs of surface ice at the lunar south pole, but these could have been explained by other phenomena, such as unusually reflective lunar soil. With enough ice sitting at the surface -- within the top few millimeters -- water would possibly be accessible as a resource for future expeditions to explore and even stay on the Moon, and potentially easier to access than the water detected beneath the Moon's surface. Learning more about this ice, how it got there, and how it interacts with the larger lunar environment will be a key mission focus for NASA and commercial partners, as we endeavor to return to and explore our closest neighbor, the Moon. The findings were published in the Proceedings of the National Academy of Sciences on August 20, 2018. NASA's Jet Propulsion Laboratory, Pasadena, California, designed and built the moon mineralogy mapper instrument and was home to its project manager.